Shiga-toxin producing Escherichia coli (STEC) also referred to as Verocytotoxic E. coli (VTEC) are currently considered as important emerging food-borne bacterial pathogens of public health concern. STEC strains are causes of sporadic and epidemic human cases of hemorrhagic colitis (HC), which can lead to severe and life threatening hemolytic and uremic syndrom (HUS), especially in young infants. The major part of cases are associated with ingestion of food or water contaminated with STEC strains belonging to the serotype O157:H7. However, more than 200 different serotypes were found in association with HC or SHU in humans. 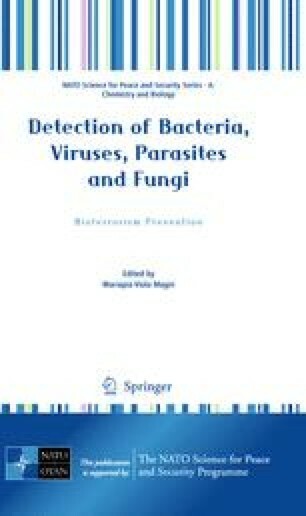 The presence of STEC in low amounts in contaminated matrix and the absence of a unique marker shared by all the pathogenic STEC make their detection very laborious. A wide panel of detection methods are now available, ranging from conventional methods based on phenotypic and biochemical properties, immunological methods, to most recent DNA-based techniques. In this review, different diagnostic procedures are described, including commercially available kits for food industry and human medicine. Recent strategies for the detection of the major serotypes associated with human disease are also discussed, and their drawbacks and advantages are detailed.